Burano is an island located in the Venetian lagoon and famous for its brightly colored houses and lace-making techniques. 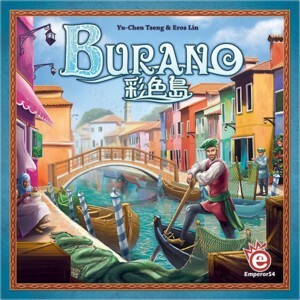 In the game Burano, players assumes the role of a family leader trying to gain reputation by building houses, trading fish, and mastering lace workshops. Whoever earns the most reputation points wins the game. Through the novel "cube pyramid-driven" mechanism, players take turns removing free cubes (i.e., those not stacked under other cubes) off their pyramid and placing them onto the island to build houses. The colors of the cubes also signify which types of actions the players can perform. With careful planning, players may build higher houses, connecting more lace workshops or harvesting more fish during their sails. The game comes to an end after four seasons, and players shall see the beautiful houses rising on the island marking their well-respected contribution to Burano.